What are P50 and P90? 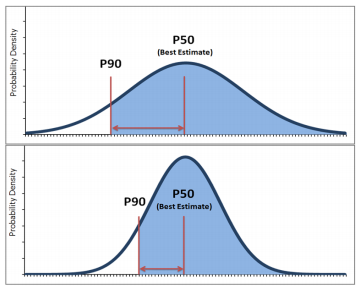 The "P" in P50 and P90 refers to probability (or sometimes percentile or probability of exceedance). A P50 value is a median value, which means we expect that 50% of the time, an outcome will fall above the P50 value, and 50% of the time, it will fall below the P50 value. P90 represents a more conservative slice of the same distribution; a P90 value is a value that will be met or exceeded 90% of the time. If P90 energy production is 1,000kWh, for example, that means that there is a 90% chance in any year that the array will produce 1,000kWh or more. Many institutions will request a P90 energy production estimate when providing financing for a solar project. In practice, P90 are typically 2-4% lower than P50 production. A bigger difference between P50 and P90 values indicates that there is more energy production variability, usually as a result of more weather variability (as shown below in the first graph, compared to the second graph). Calculating P90 using a percentage-based haircut off the P50 is the typical industry standard, including among financial institutions. To do this in HelioScope, you can add in an extra percentage loss in the condition set under soiling losses. If you would like to learn more about what a P90 and P50 are, we suggest taking a look over at HeatSpring. How can I generate a P50 and P90 in HelioScope? To generate a P50 report with HelioScope, all you need to do is select a typical meteorological year (" TMY") file for weather. TMY weather files represent P50 weather conditions, so if you select a TMY file in your condition set, you will automatically generate a P50 energy production model! HelioScope provides two options for simulating P90 energy production. Given sufficient data, either method will produce a better estimate of production than the common percentage-based haircut method. Option 1 - You can use the weather files already available in HelioScope to select individual years of data. To do that, click the dropdown next to your weather file in the Condition Set, as seen in the image below. Select individual years in new Condition Sets, and simulate reports to get an estimate of production for each year. People typically generate 12 or more energy production models, each based a different year of historical weather data (also called "time-series data") to create a P90 estimate. The more years of data you can incorporate, the better, as it reduces the uncertainty of the P90 estimate. Be careful to not include weather files from different sources of weather data (just stick to Prospector data, for example), because P90 is intended to reflect weather variability rather than differences between different sources of weather data. You can see an example of these multiple simulated reports in the image below. When you have generated all your production models, enter the kWh/kWp for each year in our P90 calculator. This will automatically calculate a P10, P50, P70 and P90 for you for any amount of data entered. Alternately, you can calculate a P90 in excel yourself. You need to find the mean and standard deviation for all your simulated values. Once you have done this, use the NORMINV function in Excel. Enter 0.1 for the probability, and your calculated values for mean and standard deviation. This will give you your P90 value. Option 2 - Create a single energy production model using a P90 weather file from a weather data provider such as SolarGIS. This is the easier option, but it requires purchasing a P90 weather file. As mentioned above, if you want to calculate your P90 using a haircut method, you can add in the appropriate percentage loss in the condition set under soiling losses. I'm outside the US, how can I create a P90? Unfortunately, Prospector and many other multi-year weather datasets are not available outside of the United States, so this option for P90 creation is not available in other locations. However, you are able to upload weather datasets to HelioScope, so if you have weather from multiple years from a different source, you will be able to conduct P90 analysis. NSRDB is a publicly available (free) source of data, with coverage in India and the Americas. SolarGIS, SolarAnywhere, 3TIER, and Meteonorm all offer global coverage for a price.